Last Post 18 Apr 2019 07:48 PM by cherryboy. 24 Replies. Thanks Kennett, I love the stories behind the signs and the cards. Interesting that they were for sale in a 'souvenir' shop; they normally only sell tat. You were either very fortunate, or you had some insider information lol. 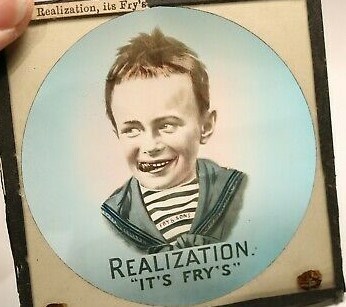 just found in a box the Frys 5 boys paper weight ..bought 20 years ago ...genuine ? not sure ..£35 if anybody is interested ...Small lettering at bottom "Appointed manufacturers to H M the Queen and H R H The Prince of Wales"
Just to make thing a bit clearer. The change tray is not in doubt, as far as I know they have not been copied. The paperweight is printed in a photo-mechanical process rather than chromo which is why I was suspicious. Nice thing Ross. He was tracked down in 1962 by a Bristol newspaper journalist living in Rhode Island USA. Ive got a set of the slides, had them years, dont really know what to do with them ! Ill think about it Ossie ! !